Have you ever tried to change something in yourself or others? How many times you have had a New Year’s resolution that succeeds? Most of us strive for better lives and try our best to achieve changes. However, we rarely get to celebrate victories in really transforming our habits, behaviors, and thoughts, thus changing our lives and businesses for good. This book blends science and practice to help people gaining rich understanding on how transformation works, what are its essential components, how to design and apply influential strategies, what novel technologies (e.g. artificial intelligence, augmented reality, and advanced sensing) are effectively facilitating change process, and what to do first thing each morning. Most of us already want changes for better. What we oftentimes miss is to know how to make such transformations succeed. This book will help you develop and internalize the necessary competences. Transforming Wellbeing Theory (TWT) is emerging as an inevitable response to the ever-growing imbalance in our lives across the globe. Over the decades, we have been advancing technologies to make our lives better. The fundamental question still remains: with all the evolving innovations, are we gaining decent success in achieving happier and more sustainable societies? All the crucial domains of our lives continuously provide evidence of things getting imbalanced despite us making huge progress in building increasingly capable technological innovations. The TWT advances scientific knowledge and its practical applications to transform lives. Due to its strong fundament that blends technological innovations with human nature, the theory is applicable in many essential life contexts, including health, education, sustainability, equality, governance, safety, emergency, ecology, and economy. Rapid technological evolution not only enables advanced innovations to emerge, but also requires to reconsider their effects on lives and businesses. With novel technologies, such as artificial intelligence, smart sensing, blockchain, and autonomy, life changing transformations are inevitable. To succeed with these challenges, we have to be mindful about human nature playing its important role in every transformation. Research on human behavior provide principles that are applicable for creating novel technologies that go beyond solely improving performance, thus assisting with behavioral and attitudinal shifts in societies. The TWT unifies knowledge about designing transforming technologies for wellbeing. It explains how technological innovations can go beyond limitations of traditional behavioral design and change management. People generally can fall into one of the three generic categories depending on their performance with regards to a specific behavior. Self-contained people (the red circle) most likely are not open for changing anything in them. They are fully satisfied with who they are and what they do on daily basis, thus many transforming efforts might fail in attempts to influence individuals from this group. Self-driven people (the green circle) typically have comparatively high levels of motivation and can achieve their envisioned transformations. Thus, these people most likely are not dependent on additional sources of inspiration and encouragement. However, there is another group of people that oftentimes would like to change their routines, but rarely succeed in doing so. This situation reminds of New Year’s resolutions that in many cases end around February. Therefore, this group is entitled as January 1st (the yellow circle) and it seems to be the most welcoming towards transforming interventions designed to help achieving their target changes. Although, all three groups are represented as circles of an equal size, in reality the size of each group might significantly vary depending on the context and particular behavior. According to the Social Cognitive Theory, any well-designed environment is a strong influencer of what people think and do. There is an endlessly dynamic interaction between an attitude of a person, his or her behavior, and an environment in which that behavior is performed. Environmental, attitudinal, and behavioral factors are locked into triadic reciprocal determinism, meaning that all three are strongly interconnected and continuously reshaping each other. Thus, environmental design is strong influencer on human behavior and attitude. In other words, quite often it is merely sufficient to improve urban spaces to help people become healthier and to create sustainable communities. This is very powerful vision as it encompasses transformation of human behavior and urban environments at scale. Knowledge on social psychology describes seven socially influencing principles that can provide extensive support for transforming processes. The principles are interlinked and have potential to exert stronger effects depending on the context of an envisioned transformation. Normative influence and social comparison seem to be more effective to achieve involvement of the target group as the two principles focus on attitudinal transformations. 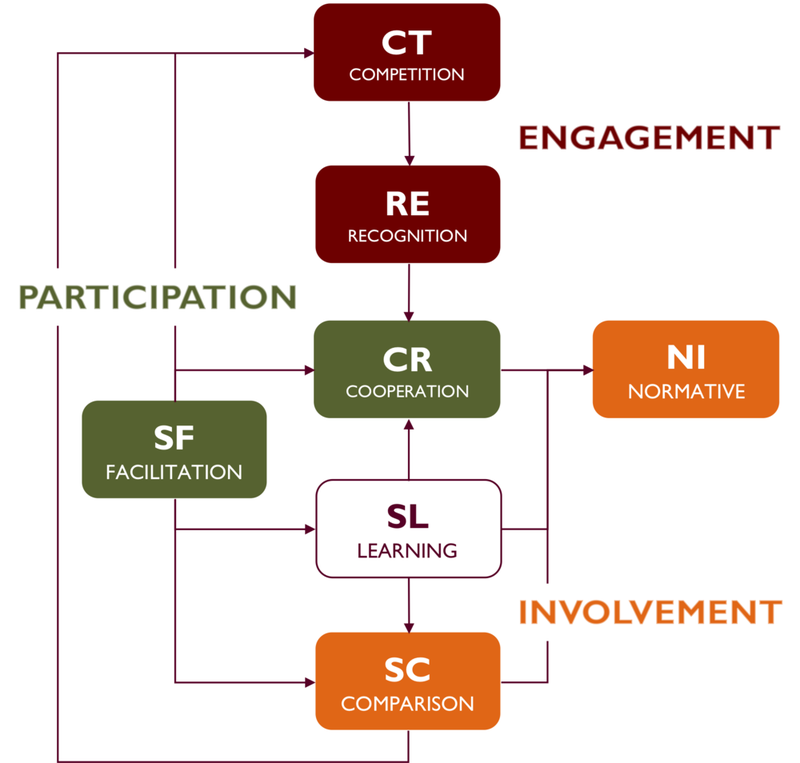 Cooperation and social facilitation seem to be more effective to make individuals participate and do the desired future behavior even without a pre-formed attitude towards it. Competition and recognition seem to be more effective in engaging the target group to do the future behavior as the principles focus on both attitude and behavior simultaneously. Social learning has always played a very central role in the evolution of mankind, as it helps to learn new behaviors just by observing others, to put it simply.